Dock Street Market is like no other place in Leeds city centre. Open day and night, this cafe/social looks like an explosion in a lego factory, drinks like Alice in Wonderland’s teaparty and tastes… phenomenal. It is unusual to find somewhere with live music, bread and desserts baked onsite, regional draught ales, a knitting club, pool tables, potent cocktails, fresh food to die for, a library to borrow from and exclusive art work exhibited all in the same place. Somehow, Dock Street Market manages just that. Dock Street Market actually started life as a kind of market for independent, local food producers and retailers to use with a space for pop-up food events, workshops and tasting sessions. We opened in December 2010 with the Riverside Sourdough Bakery and a Bottega Milanese coffee bar. Over the last 18 months it has gradually evolved in to what it is today. It is a hard one to describe. It’s not a market… but it is a bakery, a cafe, a coffee shop, a restaurant, a social and a bar all sort of rolled in to one. I’ve heard lots of interesting descriptions of Dock Street Market A I think my favourite was ‘a youth club for adults’. I just think that it’s whatever you want or need it to be. What do you think makes Dock Street Market unique? What do you offer that other places in Leeds don’t? We’ve tried to make it a place where you can have your morning meeting over coffee and pancakes, meet your mum and dad for a spot of lunch or afternoon tea, go on a dinner date, learn how to knit and meet your friends for a few cocktails before heading out in to town for the night. It is a pretty unique place. If I had a penny for every time someone had said ‘there’s no place like this in Leeds’ and a pound for every time someone said ‘There’s no place like this in London’ I’d probably have about 4.50! Where else can you see a DJ playing from inside a bakery while pouring a gin cocktail from a teapot in to a china cup? What’s your favourite Dock Street Market dish or drink? What are your bestsellers? It has to be our teapot cocktails! My personal favourite is the ‘Dock Street Mule’ A Havanna Especial Dark Rum, fresh lime juice, blueberry and apple tea syrup and ginger beer. We serve it in a teapot with 2 china cups filled with ice for 12. If you catch us during ‘Hippie Hour’ (Monday to Friday 5.30 to 6.30pm) you can get one half price. Our ‘Anchor Steam’ beer and ‘Ilkley Brewery’ ales are also really popular. Foodwise our ‘Brazilian Feijoada Stew’ has been a firm favourite for some time. It’s beef, pork and chorizo stewed for hours with black beans and served with freshly baked Sourdough bread. The same thing that makes any city awesome; the people in it. 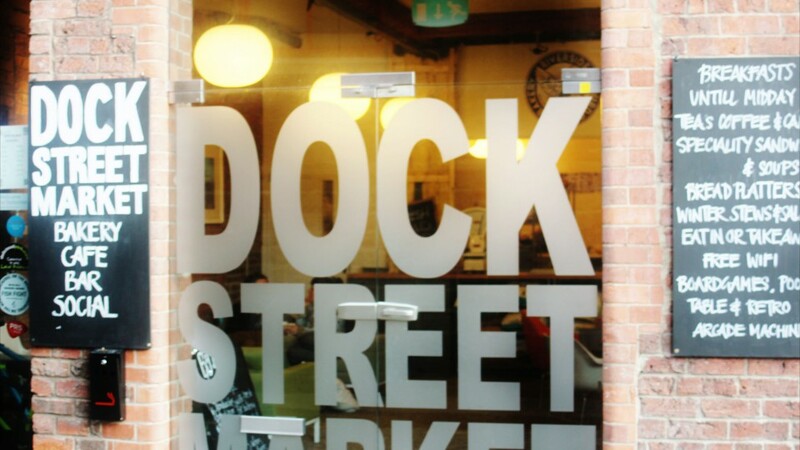 Where do the Dock Street Market crew like to hang out in Leeds? We generally like to hang out at Distrikt or The Mavern. On days off we might go to the Town Hall Tavern and our baker Phil is usually propping up the bar at North Bar when he’s not baking. We also try to make it to most of the Cosmic Slop night and Late Night Lounge Lover pop-up events A they’re both really different and really worth checking out. What can we expect from Dock Street Market in the future? We’re starting up a live music event on Sundays called Dock Street Market Unplugged. What could be better than listening to up-and-coming acts in Leeds while playing pool for free? We also have a knitting group that meet here and are hoping to build up an evening every week where groups like that can all meet up over teapot cocktails and yummy food A book groups, art groups… anything goes at our place really! The only way we can be described is Dock Street Market. Dock Street Market is currently closed. We will update you when we know more.